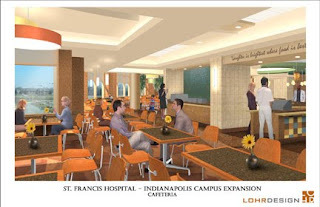 The staff of Food & Nutrition Services is gearing up for an expanded cafeteria and eating locations when the new bed tower opens on the Indianapolis campus. When complete, employees and visitors will have three dining options at the Indianapolis campus. The cafeteria will be centrally located in the new bed tower, where most visitors and employees will be located. But that’s not the only option. Jazzman’s Café will remain in its present location by the Gift Shop in the Women & Children’s Services lobby. A third option – a European-style bakery – is being considered. Rather than solely provide take-out, the bakery also would include sit-down booths and would be located on the second floor near where the cafeteria is located currently.